A coarse wool flannel woven by the Navajo from recycled yarns. 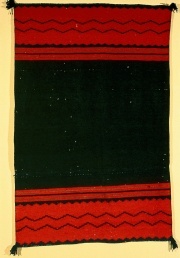 Dyed fabrics and clothing brought to the American southwest via Mexico by European colonists in the 1880s were often traded to the Navajo Indians; colorful fibers from these cloths were unraveled and rewoven into colorful blankets (Tortora and Merkel 1996). P.Tortora, R.Merkel (eds. ), Fairchild's Dictionary of Textiles, Fairchild Publications, New York, 1996.